Bethlehem, PA is a city that near and dear to our hearts. Both of Monogram Custom Pools' owners attended Lehigh University and met there during their freshman year. There are even some stories floating around about the two of them attempting to build a temporary swimming pool during a party at one of their fraternities! This might have actually been the official start of them being custom pool builders! This city is also the home of Musikfest, which is one of the largest outdoor music festival in Pennsylvania (and the United states). If you are not lounging around your Monogram Custom Pool in August and have some spare time, make sure you stop by Musikfest and enjoy some of the amazing local food (and Yuengling beer!). We've built some unique swimming pools in the area and always enjoy working in that area (especially during Musikfest!) We can build you a gunite (concrete) pool that is "Crystal Clear and Hassle Free" and requires virtually no maintenance. In addition, you can control your pool while at home in Bethlehem or from anywhere in the world via your iPhone or Android. Call or email us for a free estimate and pool design. 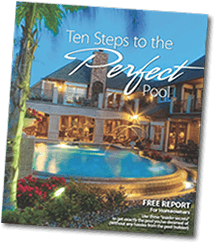 Discover the EASY way to get the PERFECT pool you've always dreamed about having.